Well, we have continued to deal with anxiety the past couple of days. It hasn’t been at an all time high like it was last week……but it is still way up from our every day “normal”. It is like my mom is sitting on pins and needles at times. 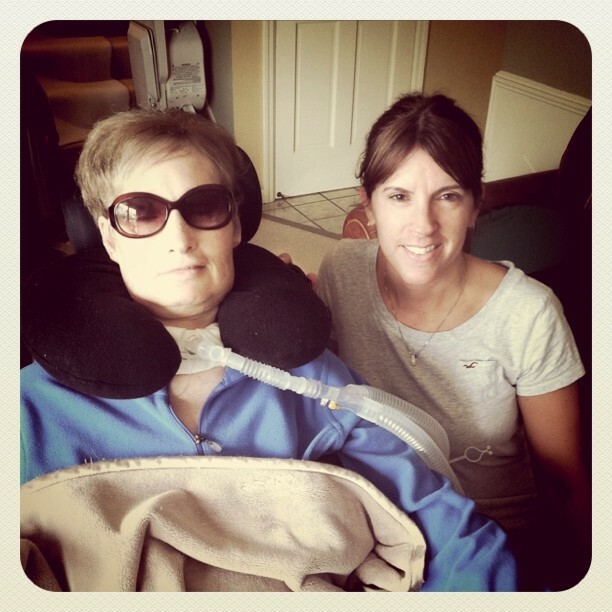 We have her ALS neurology appointment tomorrow….so we are excited! Hopefully they can give us a different drug or something. We don’t like to turn to medications, and try to treat my mom as naturally as possible….but we don’t deny modern medicine either. We try to keep a good balance of both. Or maybe they can change a ventilator setting. It could be a million little things. I will report back to you…for those that are interested! We appreciate the continued prayers in this area! Yesterday our friend Catey came over to help us out around the house & I snapped a quick picture with her and my mom. Catey had been such a blessing to our family over the past 5 years. The ALS association pays for 18 hours of Home Health Care, and when I told them that we only needed help with cleaning, they said that was not a problem. We went through several HORRIBLE Home Health Aids and I was so stressed every time they would send somebody new. I also felt horrible asking them to clean. And then one day the clouds parted & Catey showed up at our door! Hallelujah!! Over the past years she has become a member of our family, one of my best friends and we don’t know what we would do without her. She is amazing!!! And she is the only other person outside of our family that can communicate with my mom and pretty much knows what she needs. We have often threatened that she can never leave us. haha. We love you Catey! Last night I hung out with my friend Cate & got to visit with her kiddos before they went to bed. I don’t get to see them very often, so it was a lot of fun! We were having some crazy weather yesterday…..so I guess that my family was battling tornadoes back home in EP and I had no idea. All was ok in the end! 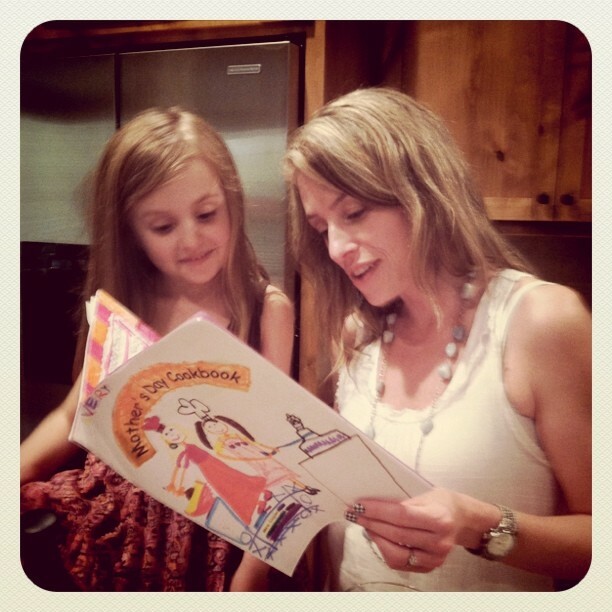 I snapped a cute picture of Cate and her daughter Avery reading a Mother’s Day Cook Book Avery’s class made. Ahhhhhh. Thanks for some great conversation and vino Cate! Cate also has a wonderful fashion blog at www.wildruffle.com. If you know Cate or her mom, you know that they are quite the fashionistas. Wildruffle is often having drawings for jewelry and fashion accessory giveaways, so I recommend checking it often! I might not dress up much when I am hanging out with my mom, but I always look forward to reading what Cate has come up with! And that brings us to today. My mom and I are watching the twins game right now. We just scored a 3 run home run……so we are hopeful we could actually win! I am hosting our final book club tonight (we take a little break for the summer)…so I am looking forward to getting together with my ladies. We read “Half Broke Horses” by Jeannette Walls. It was a really fun read…and my mom enjoyed it as well! I will let you know how tomorrow’s appointment goes! Prayer for Julie: Pray for a neurology appointment that offers us some guidance, knowledge and solutions as we enter some new territory. We will be thinking about you guys today! You hosted a GREAT bookclub last night. I am so glad we have a summer date set. Thanks for the sweet words Kelly. I love you guys and hope the appt goes well today. Of course! Love you girl!